Most of us are familiar with the “butterfly effect” which explains how the tiniest of actions can have profound impacts on everything. One of the best examples of the butterfly effect would be Ron Miller’s Pluto stamp. On October 1 1991, The Postal Service issued ten Space Exploration commemorative stamps in Pasadena, CA. The designer of the stamps was Ron Miller, of Fredericksburg, VA. The ten stamps featured the nine planets and the Earth’s Moon, along with the unmanned spacecraft that had visited each of them, except Pluto. The farthest planet was always given the last preference when it came to deciding which planet was to be explored. Interestingly, Voyager 1 could have visited Pluto but that plan was scrapped in favor of exploring Saturn’s moon, Titan. There was one little line on Pluto’s stamp that irked countless space scientists, which immediately compelled them to plan a mission to Pluto. The line was “Pluto – Not Yet Explored“. One single line from Ron Miller’s mind sparked the foundations of a mission known to us today as New Horizons. The stamp was attached to the New Horizons spacecraft as a “thank you” of sorts. The ashes of Clyde Tombaugh, the discoverer of Pluto, were also kept on board. 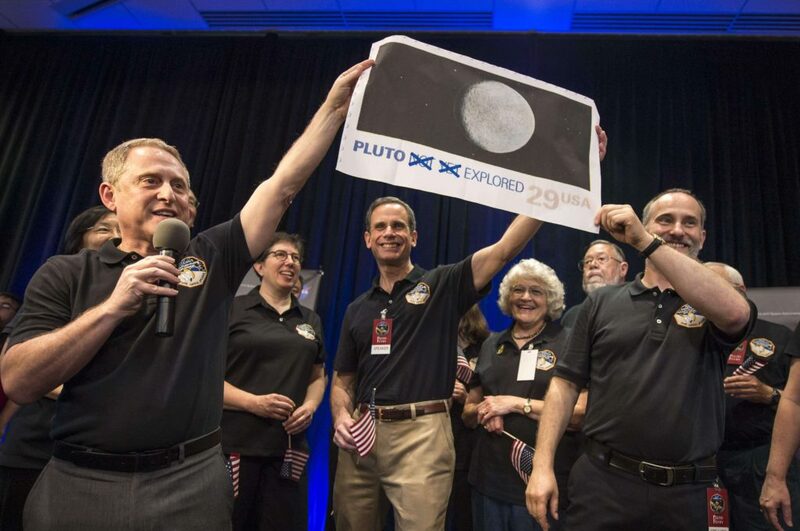 The most amazing fact is, even though a lot of scientists and astronomers had tried to get a mission to Pluto off the ground, none of their efforts materialized into a mission but all it took, in the end, was an unintended taunt printed on a stamp to get us to Pluto. As of today, the stamp is billions of miles away from Earth, racing towards the Kuiper belt and it will go beyond for countless years into the unknown depths of outer space. UPDATE (20/7/2016) : This stamp has earned the GUINNESS WORLD RECORDS achievement for the farthest distance travelled by a postage stamp ! I lack the stature to summarise a man as talented as Mr. Miller. The best word to describe him would be “polymath”. He is an illustrator, author and a member of various prestigious societies around the globe. He has received several awards during his life for his artwork and books. His list of achievements, books and memberships is too long to mention in this blog post, hence I’ve provided a few collapsed lists and links where you can read more about him. Cleopatra (Chelsea House, 2008) with Sommer Browning; foreword by Arthur M. Schlesinger, Jr.
2012 SSLI (Society of School Librarians International) Book Award, Honor Book in the Science 7-12 category: Is the End of the World Near? 1. 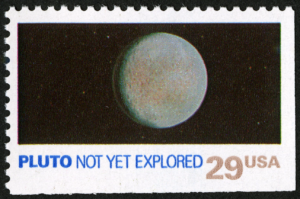 Was there a specific motive behind the words “NOT YET EXPLORED” on the Pluto stamp ? If yes, what was it ? No one thought anything about it especially, one way or another. It’s just the way it turned out. The stamps were originally meant to just show the planets. The Postal Service asked to have US spacecraft included. Since there was no spacecraft associated with Pluto at the time, there was little choice but to say something like “Not Yet Explored.” I think “Not Yet” was chosen to make it sound kind of hopeful. 2. Your stamp flew aboard the New Horizons mission, right past Pluto and is now headed towards 2014 MU69 . What was your reaction when you were told that your stamp will be a part of the NH mission ? I was very flattered, of course! 3. Do you consider yourself an author first or an illustrator? An illustrator. Many of my books are in large part an excuse to do the illustrations! 4. Would you like to share your graphic designing process? It is a combination of deliberate and haphazard, traditional and digital. Although my finished art has been digital for more than 15 years, I employ many techniques in the process. For instance, I have built models from clay and other materials, used traditional paints and even pencils, digital photography and many other media as well as Photoshop and other software. All of these things are combined into the final artwork. 5. You are a member of the selective club of people that led to the New Horizons mission. What does it feel like ? Well, all I did was supply a little inspiration. I think a Pluto mission would have been inevitable, regardless. But I am certainly proud of having played even a small role. 6. What do you consider to be your greatest accomplishment? Probably my book, “The Grand Tour.” Although the first edition came out more than 30 years ago I still get letters from people who were inspired by it. 7. Most of your illustrations and books are related to space and astronomy. Did you ever wish to become an astronaut or spacecraft engineer during your teenage years ? Sure…until I realized that doing something like that required more talent at math than I’d ever hope to have! 8. You have worked on some iconic movies like Total Recall and Dune. Why did you stop working on movies after 2002 ? I didn’t really stop intentionally. I had never actively pursued working in films: I was invited to work on those two. And if someone were to ask me to work on another film, I’d gladly say yes. That being said, I have contributed to several other, mostly low budget, features. 9. Who would you consider to be your idol ? Do you draw inspiration from them or their works ? Well, every space artist owes something to Chesley Bonestell—especially those who do the kind of realistic space art I do. But there are a great many other artists from whom I’ve gotten inspiration. The plain fact is that every artist whose work I see affects my own work in some way. 10. To add a unique twist to my interviews, I have come up with a plan to compile messages for the future from my interviewees into a time capsule, which will be opened decades later. What is your message for the future inhabitants of our planet? I’ll think of something to send to you later! Very nice! Keep it up ! great choice of questions ! !